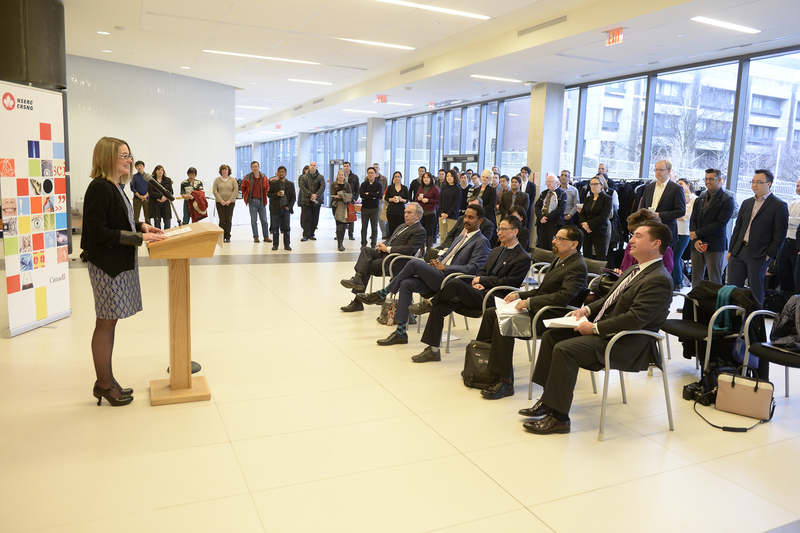 Jianhong Wu (Mathematics & Statistics) is the recipient of a $2.6-million NSERC/Sanofi Industrial Research Chair in Vaccine Mathematics, Modelling and Manufacturing. 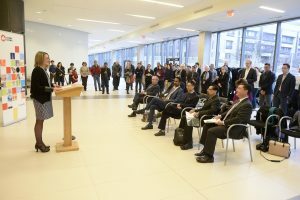 The Chair was announced at a campus that included Dr. Mario Pinto, President of NSERC; Sabina Stein-kellner, Chief Commercial Officer of Sanofi Pasteur, and her colleagues from Sanofi; senior leaders and Board members of York University; and faculty and staff from the Faculty of Science. 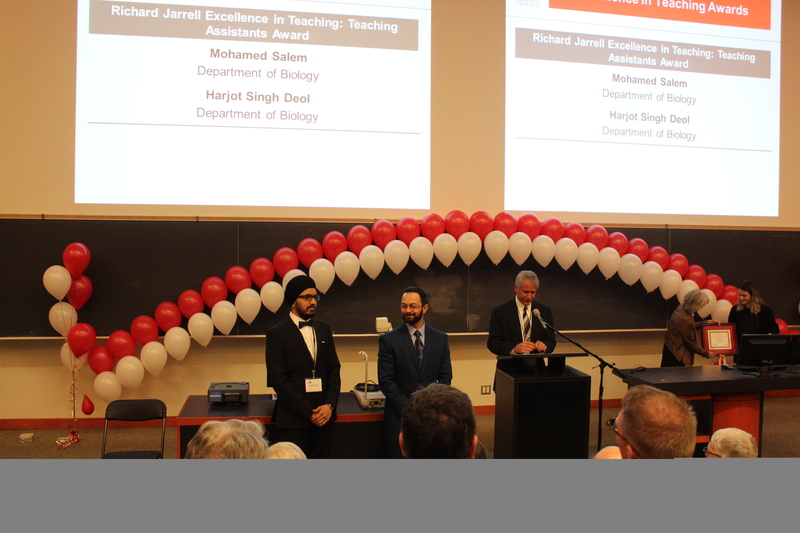 The Faculty hosted its Annual Honours and Awards Ceremony to celebrate the outstanding achievements of its students and faculty members. Science Communicator in Residence and BBC Environment Correspondent Matt McGrath gave the keynote talk. Our thanks to all of the staff who worked hard to make this event a success. New videos have been added to the Faculty’s Did YU Know channel, which tackles weird and quirky science questions answered by York Science researchers! If you have ideas for future videos, please email margaret@yorku.ca. Science Engagement Programs received $60,000 in initial CanCode funding through Actua to expand digital programming for youth. Bridget Stutchbury (Biology) received an additional $56,000 over two years from the Kenneth M. Molson Foundation to continue her research on the impact of pesticides on migratory songbirds. Postdoctoral fellow Kyeongah Nah (Mathematics & Statistics) received the Farkas Gyula Memorial Prize from the Hungarian János Bolyai Mathematical Society. 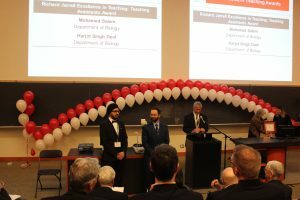 The prize is given to young Hungarian mathematicians for significant applied mathematical research. Research Matters covered studies by Kathi Hudak (Biology) and her team on virus resistance in plants. Sapna Sharma and Dawn Bazely (Biology) participated in a debrief event to discuss their involvement at the 23rd Conferences of the Parties to the UN climate negotiations (COP23). The Department of Science & Technology Studies hosted a special seminar by Ray Acheson, Director of Reaching Critical Will and Member of the International Campaign to Abolish Nuclear Weapons (ICAN). Acheson described ICAN’s Nobel Peace Prize winning campaign to achieve a Treaty on the Prohibition of Nuclear Weapons. Sapna Sharma (Biology) published the paper “What’s hot about mercury? Examining the influence of climate on mercury levels in Ontario top predator fishes” in Environmental Research. Chris Lortie (Biology) published the paper “The Groot Effect: Plant facilitation and desert shrub regrowth following extensive damage” in Ecology and Evolution. Paula Wilson and Tamara Kelly (Biology) presented “Challenges, successes and strategies for educators in higher education” at the Pearson Biology Leadership Forum with colleagues from the Universities of British Columbia and Windsor. Marko Horbatsch (Physics and Astronomy) presented his research at Jefferson Lab (Newport News, VA) and the College of William and Mary (Williamsburg, VA). He discussed the research he is conducting with Eric Hessels and postdoc Alain Marsman on the role of quantum interference in the spectroscopic proton radius determination. Kenton Kroker (Science & Technology Studies) presented “The Young, the Restless, and the Criminal: Juvenile Encephalitis in the 1920s” at the Night of Ideas hosted by the University of Toronto’s Art Museum. Laurence Packer (Biology) and his colleagues have found that the majority of research on insects lacks reliable taxonomic information, and therefore is not reproducible. Surveying more than 550 research papers from 2016, the authors call into question the scientific merit of up to 98 per cent of entomological research. Read the press release. Paul Delaney (Physics & Astronomy) commented about the super blue blood Moon for CTV News, Sirius XM, AM900 CHML and AM640. He also spoke to the latter two radio stations about the Tiangong 1 space station re-entry, Mars challenges for humans, and Asteroid 2002J129 passing close to Earth.